When trees are removed, they are normally cut above the ground leaving behind an unattractive root structure and the tree stump. It is a good idea for the stump to be removed as well as it forms a breeding ground for pests such as wasps or termites and also fungus diseases. 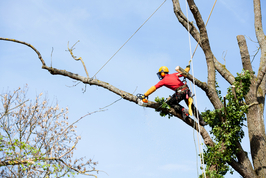 Tree Services Annapolis provides Annapolis stump removal services at reasonable rates to give you value for your money. We make sure to do a great job on your property to create a welcoming environment and in preparation for your future landscape plans. We ensure doing the job in a timely manner to prevent additional problems such as fungal root rots which produce rotting smells as the root breaks down and suckering whereby new shoots grow from the roots and trunks. Although dead stumps cannot form suckers, they can host root diseases e.g. honey fungus. Below are some of the methods employed in the stump removal procedure. This is a process that requires highly specialized equipment and expert knowledge. It is normally employed to minimize the damage caused to the surrounding areas. The stump is ground until it reaches just below the ground level. This method, however, does not get to the root of the problem. Decomposition will eventually occur over time and the area may sink if it has been replanted or paved. This levels out the area completely and gets to the root of the problem, literally. It digs out the entire root section out of the ground. It is considered to be the best Annapolis stump removal option as it leads to minimal sinking risk of the area. This requires use of chemicals that speed up the rotting process. It may take a period of up to 6 weeks. It then enables you to break away the stump sections that you intend to dispose of bit by bit using an axe. Even then, the root system will not be completely disengaged. The same applies to burning your stump. In areas that are extremely wet, this option may not be applicable. For the best results for your Annapolis tree stump removal, contact Tree Services Annapolis. This ensures you of guaranteed quality service and safety in the stump removal process.